One of the most interesting computers to come to market in the past year is the Raspberry Pi. Of the many uses I’ve come up with for this diminutive device is to treat it as an upgrade to my Apple II, or, thought of another way, the Apple II as a crazy cool case for the Raspberry Pi (RPi). Now, for the past 20 years, people have speculated what the next Apple II could look like. The last issue of Juiced.GS, the only remaining Apple II periodical, had an interesting article about the Apple II nx (next, unix, ???). Of course, everyone has their own idea of what the next Apple II should look like, but there are a few obvious traits: at least 32 bit CPU (6502 derivative preferred), some sort of unix OS, up-to-date graphics, modern connectivity, programmer focussed. Kind of sounds like the RPi, huh? For those that don’t know, the RPi has an ARM processor (who’s designers used the 6502 as a source of inspiration), has a fairly powerful GPU with HDMI output (and composite output for us retro types), USB 2.0, SD card storage, and 512 MB of main memory on the Model B (256 MB on the Model A). 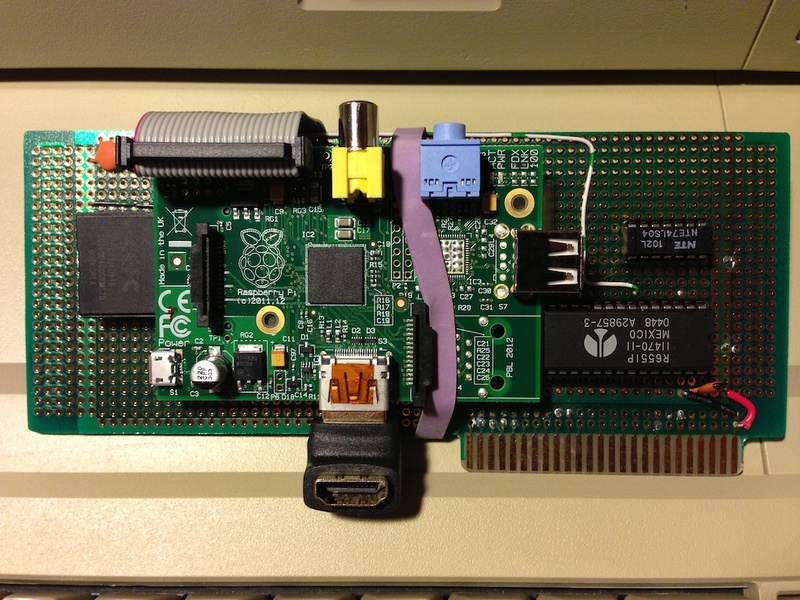 If the RPi was to work with the Apple II, what would the interface be? The RPi has a 26 pin GPIO header capable of driving many types of serial and parallel protocols. There were some early discussions about how an RPi could interface to an Apple II bus and control the peripherals at a low level. There was never a satisfactory solution given the low number of I/O pins and the difficulty programming them in real-time from Linux. So I settled on a different approach – use the TTL serial port available on the RPi GPIO header as the communications channel between the RPi and Apple II. 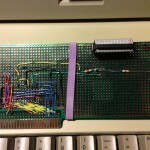 The Apple II becomes a co-processor, of sorts, to the RPi. An additional benefit of a serial interface is that the IIc can partake in the upgrade. 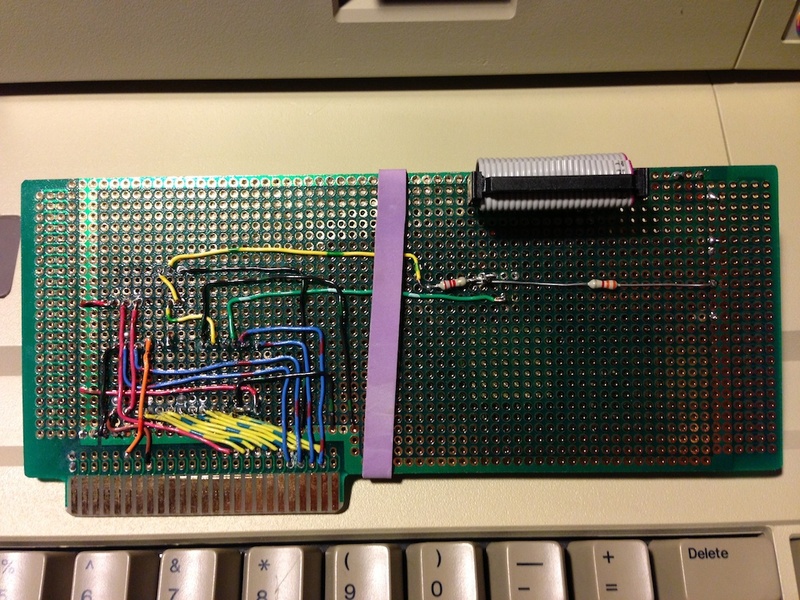 The Super Serial Card in the Apple IIe would be the first implementation of the serial interface followed by a dedicated prototype card that would accept the RPi and connect to an on-board serial chip. A protocol was developed to allow the Apple II to communicate at 115K baud without interrupts, sending keyboard and mouse events to the RPi. The RPi can insert a request command to the Apple II, which will be followed by the Apple II enacting on the request in it’s event loop. Currently the RPi can request memory reads, memory writes, and calls. A small assembly language program runs on the Apple II while a small daemon runs on the RPi. 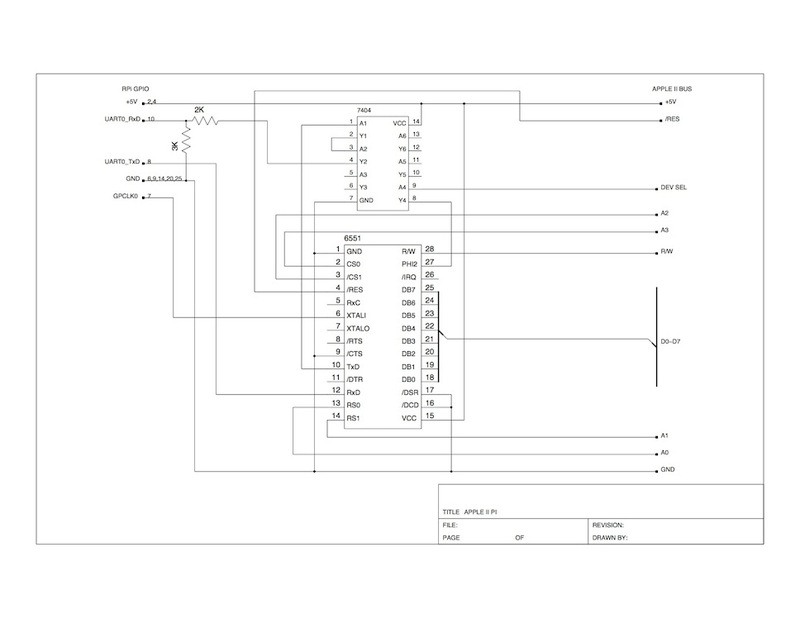 Both talk to each other over the serial port; the Linux daemon inserts input events into the Linux input subsystem as well as having a socket interface to accept requests to pass on to the Apple II from external programs. 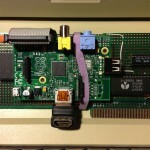 The software was developed on an Apple IIc with a serial cable connected to a TTL->RS232 converter on the RPi’s GPIO serial pins. Merlin 8 was used to develop the code locally on the Apple II while the Linux daemon was written in user mode C (no kernel modules). Neither program’s source code is particularly attractive, but they get the job done. You can find the source code and Apple II disk image on GitHub: https://github.com/dschmenk/apple2pi. Note that this code isn’t really tied to the RPi. It will actually work with any modern Linux distribution on an x86. There is one final software addition needed before the hardware will work. In the source distribution is a program called a2serclk. This will program the GPCLK pin to output the 1.8432 MHz clock signal needed for the 6551 baud rate generator. Without this, the 6551 would require a physical crystal oscillator connected to the XTALI and XTALO pins. Place a call to” /usr/local/bin/a2serclk” right before the call to “/usr/local/bin/a2pid –daemon” in the /etc/rc.local init script.